The Galactic War is a challenging survival round kind of battle. Much like the arena battles, you get to fight different opponents, but your character’s health and cooldowns carry on to the next battle. If a character dies, he or she will be unavailable until the time resets. As a beginner, you won’t have many characters to use, so we will be going over the best characters to use here for newbies. All characters will have the same health and cooldowns for the next battle. So save your cooldowns when you are almost done with the fight. Blow all your cooldowns at the start of the battle. You can retreat if you know the battle isn’t in your favor during any of your character’s turn. Eventually, you will want to build 2 teams to tackle GW as you will face stronger and stronger enemies as you progress. After getting a kill, if your team’s health is all green, retreat to use it as a save state. 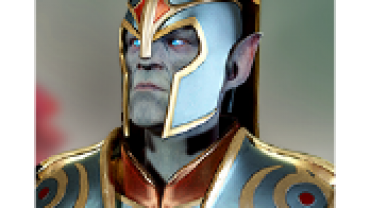 When you go back in, all buffs and debuffs are gone, but everyone’s turn meter is full, health is the same, and the enemy you killed is still gone. If someone on your team dies, close the app without retreating, and they’ll be alive again when you go back in. With Talia and Jedi Consular being your only healers, it is very crucial that you try to keep them healthy at all times. If any of the members die at any stage of Galactic War, you will be unable to carry on due to lack of sustain. That brings us to the next useful monster – Chewbacca! A lot of people don’t like him because he doesn’t provide damage. However, he is useful in GW due to the taunt and a heal to follow up with it. This will put pressure off your healers for a bit while their skills are on cooldown. Since these 3 are already free, we will talk about what you need to do with them. They are all farmable characters, so upgrading them is extremely easy. As for JC, get his Jedi Healing skill to as high as possible. Also make sure to Saber Strike to level 3 so he will have 25% change to reduce his skill’s cooldown by 1. This is vital and will help if you REALLY need it in tight situations. His 3rd skill Attack as Defense also becomes quite good once it can ignore defense 25% of the time. All in all, you should try to farm his shards as much as possible to make him stronger. His gear is very easy to get, so please upgrade it to gear 7 as soon as possible. He is vital to your progress in GW. 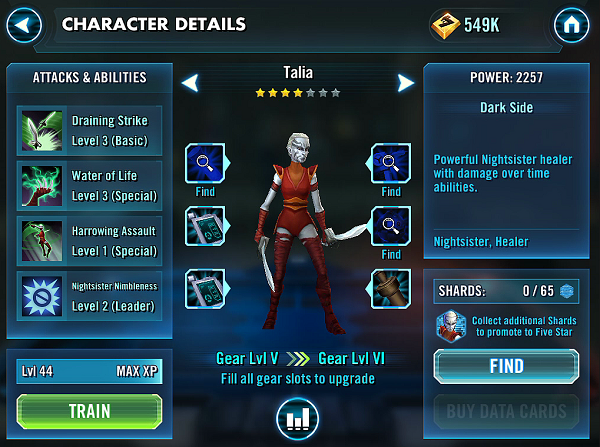 Now Talia becomes really strong once you are able to get her draining strike heal percentage to 50%. This will make her Water of Life AoE heal more safe to use. She also does good damage with her special harrowing assault. Try to upgrade her skills to as high as her level allows it. Also be sure to upgrade her gear since the parts are quite easy to get. You just need to be patient and farm up the necessary stages. For him, make sure to upgrade his gear to at least level 4 to unlock his 4th skill. He needs the 35% self heal to be an effective taunter. Otherwise, he will easily get gun downed after. 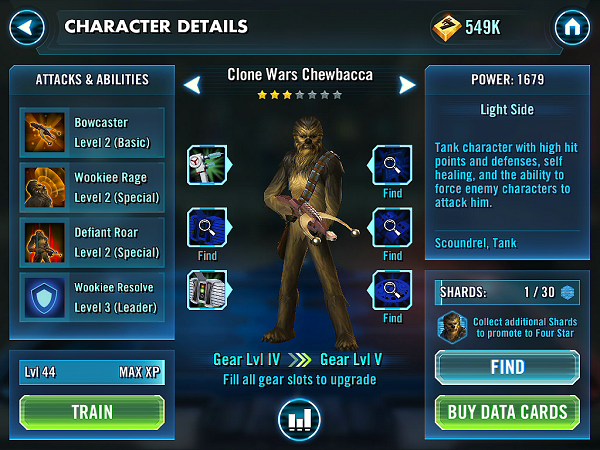 For his skills, upgrade Wookie Rage to level 3, Defiant Roar to level 3 for the 1 turn cooldown reduction. I made the mistake of leveling the Leader Skill Wookiee Resolve, which isn’t as important. Getting him to 4 star will also help with his tankiness. Now the odds of you pulling another healer from the crystals you earn are quite low, so I have listed other characters that people get along the way that will be useful. Old Daka – Available from Squad Cantina shipments for 400 cantina credits. She has AoE heal and small chance of revive. Very useful. Try to get her asap. Barriss Offee – You can get her now from the night sisters package if you are willing to spend $50 USD. Otherwise, if you got her from data cards, then her equalizing heal will really keep your low health characters alive. She also has a small regen heal when you get her leader skill to level 3. That helps as well. 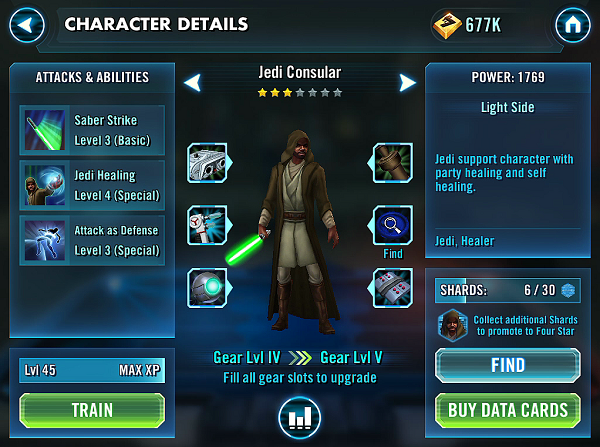 Luke Skywalker – Easily farmable from Squad Cantina 1-B and does good damage. Recommended as a damage dealer unless you pull Kylo Ren, Count Dooku, Anakin or Mace Windu. Count Dooku – Deals tonnes of damage to Jedi’s and stuns them. Plus COUNTER COUNTER COUNTER… Enough said. Keep him alive and he will keep dealing damage. Kylo Ren – The anti-healing debuff will destroy JC and any other healer’s effectiveness. You are really lucky to pull him. 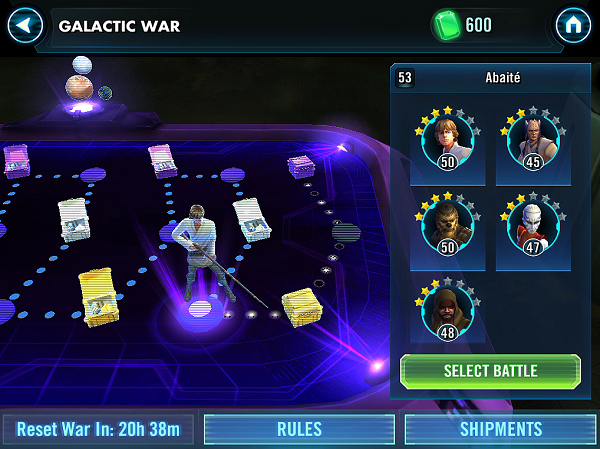 Mace Windu – Tanky and deal tonnes of damage. Poggle The Lesser – Available in GW, this guy does well in a droid team(HK-47, IG-88, IG-86 and 2 healers). Darth Sidious – Goes well with high critical characters like IG-88 and Luke Skywalker. You can get him from Arena shipments. The anti-healing debuff destroys healers. He is also much easier to get compared to Kylo Ren. Stormtrooper Han – Works well with other healers to keep him alive. He gives you turn control and also more turns. That means more heals and damage. He is available to collect via Arena Shipments. I will be adding more details when I can consistently complete GW successfully. Awesome guide but where is the resistance pilot? Can you add him please?